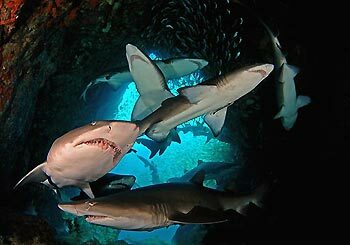 Sharks will generally hunt at dawn and dusk and at night, but like many predators will feed at any time they come across prey unless they have just eaten and some female sharks � like the female Grey Nurse Sharks � do not eat at all during mating season. What do I do if I see a shark while I�m swimming? 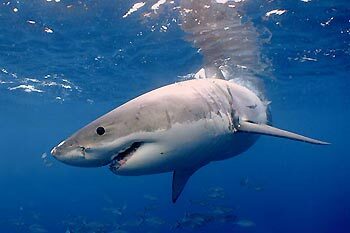 If you are not sure of the species or intention of the shark you should calmly, quietly and quickly leave the water. However, if it is for example a Leopard Shark, a Port Jackson Shark or a White-tip Reefshark you might consider getting your camera out and take a few shots. In any case treat it with respect and don�t try to pick it up, prod it or provoke it in any way. This has to do with their world-wide distribution as these species can be found in many places, size and choice of natural prey. And lets be realistic no-one is reporting the fact they were nibbled on by a Small-eye Pygmy Shark (maximum size recorded 22 cm) and it would be unlikely too since they live at a depth of 2000 � 200 m.
Harmless sharks would include species such as the Port Jackson Shark, Leopard Shark, Blind Sharks and most smaller shark species. However, as with all animal � wild ones in particular - sharks that are cornered, harassed or threatened can respond unpredictably. Various strategies can be found on how to �fight� a shark in books and on the web. Logic tells us that indeed it would be sensible to go for areas that are most sensitive such as the snout where the ampullae of Lorenzini are located, the eyes or the gills. While you are at it pull its claspers if it is a male. Practically, would you really be able to reach those spots whilst you are being attacked? Is it true that if I wear a black wetsuit, sharks will think I�m a seal and are more likely to attack me?